Something inside me wanted to respond, “You’re not dumb. Please don’t say such things because they’re not true.” I kept silent, but I’m kind of sorry I did. 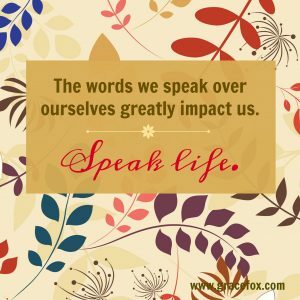 The words we speak to ourselves carry tremendous impact. They can breed death and discouragement or breath life. They influence our attitudes that in turn influence our behaviors. For example, the woman who tells herself she’s “so dumb sometimes” will likely believe she’s incapable of successfully handling new opportunities. Why even try when failure’s certain? She may be afraid to make decisions or express her opinions. Another example—a woman in a difficult marriage might tell herself, It’s hopeless. He’ll never change. I can’t do this anymore. Before long she believes these words are true, and her life rolls out like a self-fulfilling prophecy. On the other hand, a woman who speaks truth over herself will experience hope in the midst of seemingly hopeless situations. She’ll also experience transformation as truth replaces lies and brings change. Here’s a portion of Scripture that’s blessed me recently. The words “I say to myself” especially caught my attention. They challenged me to think twice about the words I speak to myself and to reject anything that’s demeaning or discouraging. I choose to speak life, to speak truth about God’s faithfulness and unfailing love. When I do, it’s impossible to remain in the pit of dejection. I can’t help but find hope when I focus on the Lord’s goodness and daily mercies. I encourage you to write this passage on a recipe card and either post it where you’ll see it often or tuck it in your wallet to take with you. May we be mature enough to recognize the lies when they come and to replace them with the life-giving words of God. “The unfailing love of the LORD never ends! By his mercies we have been kept from complete destruction. Great is his faithfulness; his mercies begin afresh every day. I say to myself, ‘The LORD is my inheritance; therefore, I will hope in him!’ The LORD is wonderfully good to those who wait for him and seek him” (Lamentatons 3:22-25). 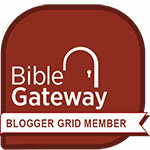 Thank you precious Grace for the lamentations 3:22-25 encouraging words! Yes, I’m going to post them before my eyes. Yea though I walk thru the valley of the shadow of death, I will fear no evil, for thou art with me….amen. I “see” no hope with my physical eyes in my everyday heart -ache I carry but I know my redeemed liveth, and so appreciate you being that precious vessel to help “strengthen” our spiritual muscles, to help hold up our faith shield in the battle! Hi Dara. I love that you wrote, “I know that my redeemer liveth.” That’s what gives us hope. He overcame death–physical and spiritual alike–and He is our source of hope. Never give up.